I’ve been thinking a lot about why family vacations seem to bring us closer. Developing shared interests and just having time to spend together are big factors, but I think the main reason is that we bond over outdoor adventures with kids. You’ll end up with incredibly capable kids. It’s (don’t let the kids read this) educational. You’ll instill safety consciousness in your children early in their lives. Your own life will be enriched. To this I would add that when you don’t think and just do, petty complaints melt away as the shared experience unites the group. Usually. Some of our first outdoor adventures with young kids were as simple as walks in the park or beach outings. Still, mishaps and poor planning derailed many a pleasant afternoon, but we got better each time. Over the years, experience and greater maturity enabled us to conquer more ambitious expeditions, until even backpacking in Yellowstone National Park or trekking the Himalayas were doable. For the most part, there aren’t any outdoor adventures that my family won’t try. But not every activity is a good fit. 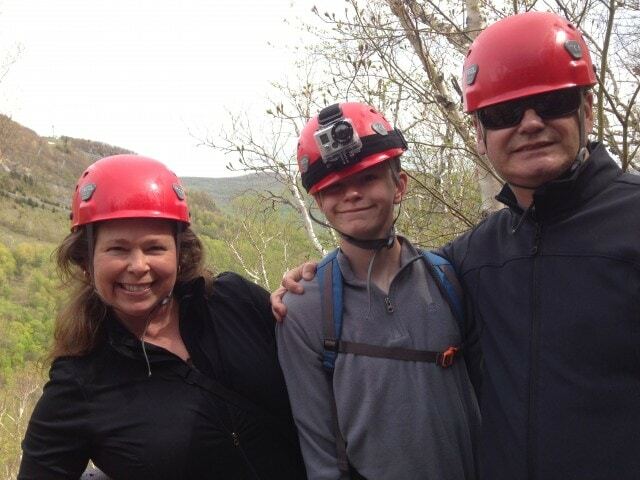 The Zipline tour at Hunter Mountain–the longest & highest zipline tour in North America–was something I was dying to try. My family was game to give this a go when it opened in 2010, and yet we had to wait until this summer because my youngest didn’t meet the minimum weight requirements until now. And yet, in the mix of outdoor activities, we found common ground. Despite big grins during the trail ride, Daddy and son commiserated over how uncomfortable it is for men to ride horses. 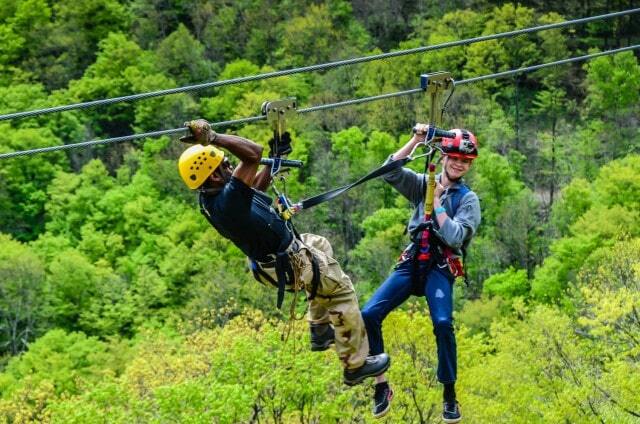 Facing our fear of heights and finding that the Zipline wasn’t nearly as scary as we anticipated, we left Hunter Mountain on a natural high. By the time we returned home from our weekend getaway in the Catskills, we were a different family. Relaxed, able to communicate without that accusatory edge that creeps in during prolonged weeks of stress, and genuinely smiling with each other. Big, happy smiles. That’s the best reason for outdoor adventures with kids. I love the point made about how outdoor adventure promotes capability in kids. I have found this to be very true as my kids have grown to be highly competent (and confident!) not only in the backcountry but with their own physical limits and capabilities every day. They seem far more likely to try something new than many of their peers. Great post! Thanks for including me. I love this post!! We really do need to vacation together (and bring Amy too). By the end of our recent road trip, after almost 3 weeks sharing hotel rooms and bathrooms together, my boys were happily playing with each other in the pool. My youngest usually gets annoyed with my oldest when he pays attention to him. By the end of our trip, he was all smiles as his brother threw him around in the pool. When I forgot my phone in the car, my middle son took charge, telling me to stay behind with his younger brother at the METRO station while he ran back to the car – because he’s faster. It may seem silly, but after figuring out the METRO system in DC and the subway in NYC I thought – “ok, my kids are ready to navigate the rails in Europe on a gap year or post graduation trip. Can you imagine? Our kids would be off and running in no time! This is so true. We have the very best adventures with our kids outdoors. We couldn’t agree more that outdoor adventures strengthen families. In our adventures, we’ve face our fears together (heights, open water, large bugs) and support one another through each challenge. We’re more like a family when we’re outdoors then at any other time. Very true. All the families I see that have close bonds with their kids tend to be very active and do a lot of activities like cycling etc together. we agree. outdoor kids, challenges, fresh air, brotherhood, using their bodies, exploring the limits and the beauty of nature. love it. so happy to read this. I wish my family and I had done more outdoor adventuring when I was a kid. We were scouts and we did some camping, but I would like to be more outdoorsy now – even my mom recently said that it’s strange to see me with so few hobbies anymore! Great article. Lex @ Lex Paradise recently posted..Win a trip to Busan, Korea this season with LeX Paradise! So glad to hear that you all are taking advantage of the incredible fun that the outdoors offers! I absolutely love being in the outdoors and my husband and I push each other to do things we might not otherwise do. Zip lines are a little rough for me as I’m not a huge fan of heights, but I always try and do them with him and end up having a great time! 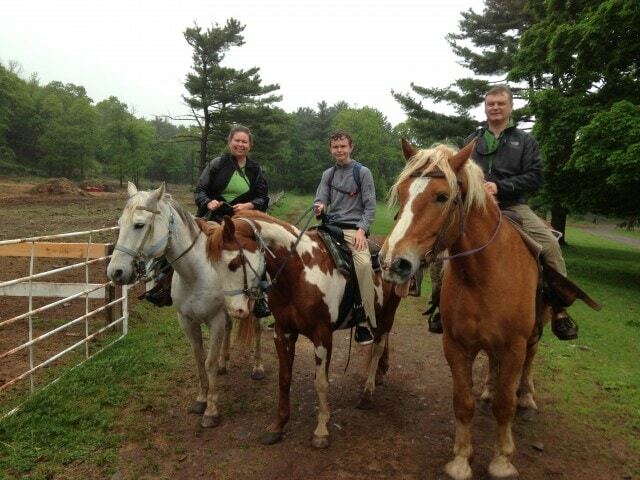 I can think of an eighth reason for an outdoor adventure with the kids — you get to ride those great-looking horses! That looks really fun. Love this article! Outdoors is promoting coordinating in Erika and I love the family time too!